While feeding the ducks this morning, I came upon a fat little male house sparrow crouched on the sidewalk. I couldn’t let him lie there on the cold cement, so I brought him inside, put him in a box on a cloth (my graduation gown), and left water and mealworms within reach. (I tried to feed him water from a dropper, but he rebelled.) 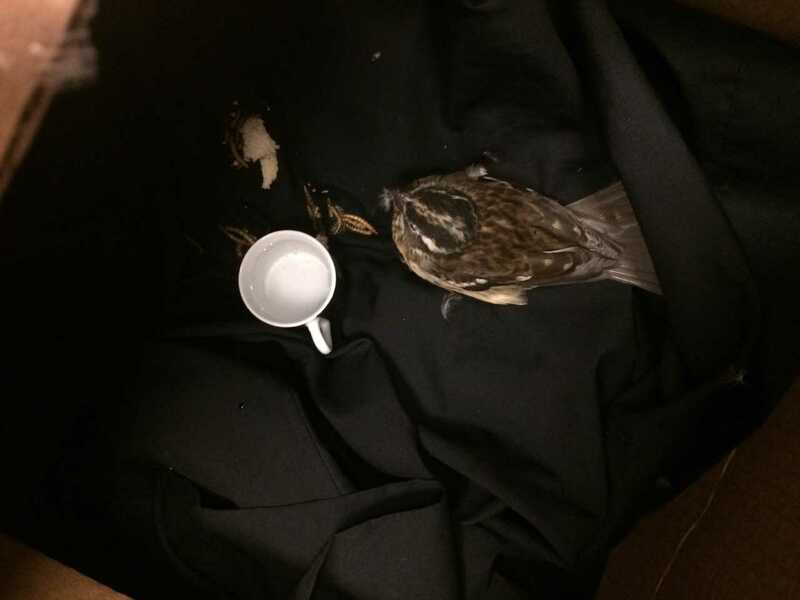 I am of course worried about him, and I don’t know how to take care of debilitated birds (I don’t know if he’s sick or hit a window), so if you have any suggestions please put them below. Soon. Thanks. Posting may be light today. This entry was written by whyevolutionistrue and posted on September 29, 2018 at 10:28 am and filed under Uncategorized. Bookmark the permalink. Follow any comments here with the RSS feed for this post. Both comments and trackbacks are currently closed. Feed seeds, even cereals that you can wet a bit. It looks healthy and it does NOT look like a House Sparrow. “If you find an injured bird, call the Chicago Bird Collision Monitors hotline, 773-988-1867, or contact a wildlife center, to determine what you should do. I called them and they’re trying to arrange for somebody to pick up the bird. It’s fairly active but still debilitated. Thanks for the number. Find a small box for the bird and put it in. Cover with a cloth. Cease trying to feed or water the bird. After a bit (10 minutes or so) take outside and see if it will fly away. If not, try again every 10-15 minutes for an hour. If still alive after an hour or so call your local Audubon chapter to locate a bird rehab organization or look online if they do not answer phone. I believe there is a bird rehab agency database online. If the bird survives shock for an hour it has a chance. Most do die from shock rather quickly. Window strike is number one killer I think. We have birds crashing into our greenhouse now and then (mostly doves). If they break their necks, then that’s it. Most of the time they are disoriented and recover within 2 hours. If your bird suddenly starts flying around the room you know that it’s ready to be released (if you can catch it). Good luck. A useful book is “Care of the Wild Feathered & Furred: A Guide to Wildlife Handling and Care” by Mae Hickman and Maxine Guy. I hadn’t thought about that Harry Crews piece in god-only-knows how long. Hadn’t thought about ol’ Harry, the late madman Southern Gothic novelist and essayist, for a long time either. Sounds like you’ve been given a lot of sound advice. Good luck. I used to work for a local chapter of the Audubon Society and we would get calls about injured birds every day. If the bird seems able to fend for itself put it up in tree or high place we’re it can’t be stepped on or eaten by a cat or dog. If the bird seems to be in worse shape put in a covered box or paper bag with a cloth or paper towel. I would call the number another person suggested earlier. At the Audubon we had a team of volunteers who would pick up birds and bring them to a vet/rehab group that specialized in wild birds. I’m not familiar with North American sparrows but it might be a song sparrow? Hard (for me) to tell from this angle. Hope it recovers and bravo for helping the little fellow. It appears to be a female rose-breasted grosbeak, and, as the next post reports, it’s been picked up by a volunteer from the Chicago Bird Collision Project and taken out to the Willowbrook Wildlife Center for rehabilitation. I thought it looked like a R-b Grosbeak. Really nice birds! Last year I found a blackbird crawling around on our lawn, drooping its wings – I assumed it had been mauled by a cat – so I left it alone to die in peace. After an hour it still hadn’t died and it appeared to be externally undamaged so I Googled and found a bird rescue place just three miles away. Put the bird in a box and took it to the sanctuary. They thought it might have been poisoned – we hadn’t put out snail bait recently but of course the neighbours could have, anyway I left it with the sanctuary. I think they just gave it water and left it in a warm quiet place to see if it would recover. Unlike PCC I was cautious not to put any valuable objects under the bird.